To get pace in information technology, Information System (IS) flexibility is necessary. In order to be operational, an information system needs to be flexible, that is, it must be able to accommodate a certain amount of variation regarding the requirements of the supported business process. Though there are numerous studies conducted earlier on the flexibility of organizations, processes, and various organizational technologies, the economics of flexibility are not yet well agreed. In contemporary business atmosphere, majority of organizations find themselves in dynamism. Traditional business processes featuring repetitive transactions and routine activities will no longer serve in such environments. Progressively, organizations must adopt changes and go away from old rigid organizational structures and management processes. There is a need to be more flexible organizational designs and management practices to acclimatise to rising global competition, fast technological change, and more exacting customization demands from customers. New, more flexible organizational designs, management practices, and business processes of some companies allow them to compete and gain competitive advantage in their industries (Gunasekaran, et,al,. 2008). Purportedly, one of the major contributors to organization productivity and performance has been information systems (IS). Researchers have acknowledged that the development of more flexible IS will support the need for more flexible, agile organizations. For instance, in telecommunication industry, rapid changes occurred since the opening of its markets. In present scenario, technological convergence has transmuted the industry into a very fast-changing environment because of the so-called triple play of services (consisting of the provision of voice, data and media services on a unique network) can now be delivered. Alliances, mergers, and acquisitions have re-shaped the industry. The concept of flexibility is a vague term and with many different inferences. It can be used as an integral property of an entity such as an information system, functional area, or organization. It can also be regarded as a response capability to predicted or unforeseen changes in the organization or environment. Many theorists defined flexibility as the capability to adapt to new, different, or changing requirements. There is also a temporal characteristic to this view of flexibility. One might ask how quickly the response should be for an entity to be considered as "flexible." Flexibility has been a topic of research in many business disciplines including economics, organization studies, decision theory, manufacturing, and information technology (Byrd, T.A., and Turner, D. 2000). It is emphasized in numerous researches that firms not only need to maintain flexibility of information systems, but they need to search for opportunities in their environment and employ concepts and instruments for deciding how to leverage flexibility for organizational success. It is shown in technical studies that flexibility is a latent construct, a characteristic of an information system that can not directly be discerned by observing the system at runtime. There are two main dimensions of flexibility that include Structural and process flexibility [NN97]. Structural flexibility denotes to characteristics of information systems themselves, such as modularity, acceptance of change or consistency. Process flexibility is described as the ability of organizations to adjust information systems to new situations. This includes the skills necessary for adaptation such as programming, change management or coordination of activities (Knoll and S. Jarvenpaa, 1994). Efficiency can be explained as the ability to minimize degradation in performance of a system within some defined range. Responsiveness is related to the temporal dimension. Responsiveness is described as the speed of a response to change stimuli. Das and Elango describe responsiveness as the quickness and swiftness of actions of being proactive in exploring opportunities while guarding against threats (1995). Other investigators have also given similar characterizations for this metric of flexibility (De Leeuw, A., and Volberda, H.W. 1996). The next metric is versatility which measures "the extent to which the organization has planned for, and can respond to environmental change". Robustness measures the capacity of a system to be responsive to unexpected environmental changes (Golden, W., and Powell, P. 2000). Information system is elaborated as the "arrangements of people, data, processes, and IT and their interactions needed to complete organizational tasks" (Jacome, L. 2007). Information system flexibility allows organizations to maintain control and react to constant changes in hypercompetitive, rapidly changing environments. There is indication in theoretical studies that information systems show relationships between flexibility and efficiency that are similar to the ones found to exist for manufacturing systems. For example, Silver (1991) presented that both, an extremely flexible and an extremely restrictive (inflexible) design of a decision support system can inhibit system use and with it system success. While the extremely restrictive decision support system clearly limits the user to only certain types of procedures and precludes the use of others, the extremely flexible system can discourage usage by being too overwhelming for the inexperienced user. Soh, Sia, Boh, and Tang (2003) indicated that increasing flexibility of an enterprise resource planning system leads to an increase in complexity. Many technical experts view an information system as an activity system in which all activities are information activities. They register, store, manipulate, and present information about a domain of interest to actors in support of their activities (Checkland and Holwell 1998). An information system contributes significantly in material and synchronisation activities as well. Material activities may be mediated by digitally controlled machinery and many coordination activities are communication activities in which actors express requests, requirements, contracts, and evaluations. Other information systems operate in ways that are extremely integrated in material business activities. They are part of the business activity system instead of just systems that support business activity. An information system can conduct vital business activities and it can support business actions that are performed by other information systems or by human actors. Information systems are much more than IT-systems. In all businesses, vital information activities are performed by human beings. And the information activities that are performed by IT-systems are planned and programmed by human beings. An Information technology system is an information system in which all performers are IT-actors. An Information technology-actor is intelligible unit of software and hardware. It is composed of sensors, actuators, memory, and activities. An IT-actor uses sensors to register information about its environment in terms of selected events, measurement values etc. An IT-actor uses its memory to remember information about selected aspects of its history. An IT-actor can influence its environment by means of actuators that delivers information, turns switches of/on etc. An IT-actor can perform activities in terms of alteration of information, movement of information etc. Innovative IT-actors are used in many computer games, internet-based systems, and business intelligence systems. Even the simplest IT-functions can be viewed as IT-actors. Therefore, the notion of IT-actors is general enough to cover both the simplest and the most advanced IT-systems. Use cases can be used to specify reactive IT-actors but they cannot be used to specify proactive IT-actors like web site crawlers or business intelligence monitors. Many technical professionals visualize IT-systems, information systems, and business systems as activity systems in which actors conduct activity. 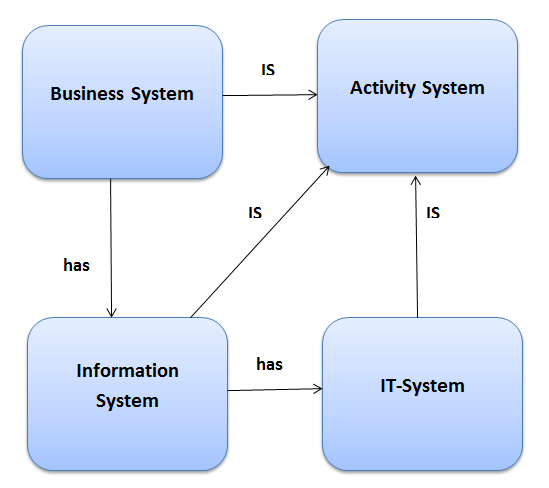 Business systems contain information systems in the sense that parts of business may be regarded as an activity system that performs information activities. Information systems may contain IT-systems that perform information activities. A business must constantly change to maintain the significance of its action repertoire. The business can use an amalgamation of two strategies to guarantee such maintenance. It can acclimatise to its environment and it can seduce its environment by offering new or improved activities. A significant subset of a business' activities are done by information systems. These activities must constantly be changed as a part of the change of the business. A significant subset of an information system's activities are performed by IT-systems. These activities must continuously be changed as a part of the change of the business. Many systems development methods are activity-based in the sense that they recommend that information systems development should be based on an understanding of existing and future business activities. There are some previous tactics such as Structured Analysis (De Marco 1978) and ISAC (Lundeberg et al. 1978) that use graphical flow models to signify current and future work activities. Multiview is a method that combines thorough activity analysis by means of Soft Systems Analysis with Structured Analysis (Avison and Wood-Harper, 1990). Various techniques can be used for activity modelling. Activity-based design is a technique that models work actions and their mutual dependencies (Andersen 2006). Action-based modelling is a modelling method that is based on the language-action viewpoint (Agerfalk and Eriksson 2004). When observed from a flexibility and change standpoint, all the methods and techniques share a common deficiency. They do not offer a business level representation of the structure of information systems and IT-systems that enables a discussion of change in terms of business concepts. They use work activities in different ways as foundations of the development of information systems and IT-systems but they do not recommend that the structure of the systems should reflect the activities they perform or support. When a business adopts to change an information system, the decision is made in business terms like actors and activities. If the information system is not structured around such concepts, there will be a gap between the business intentions about change and the actual information system changes that has to be done. It is argued that information systems should be structured in terms business actions. It is considered that characterize IT-systems as activity systems in which information technology performs information activities. Activity systems are systems in which players perform actions in order to generate value for customers and owners (Checkland 1981). The value can be created in terms of products or services (Alter 2006). Activity systems are composed of related actors, things, and information. The term actor is used as a reference to both human beings and IT-systems even though human beings and IT systems perform actions in very dissimilar manners (Rose et al 2003). Actors perform activities and interact with each other. Actors create and exchange material objects and information objects with or without the support of tools. 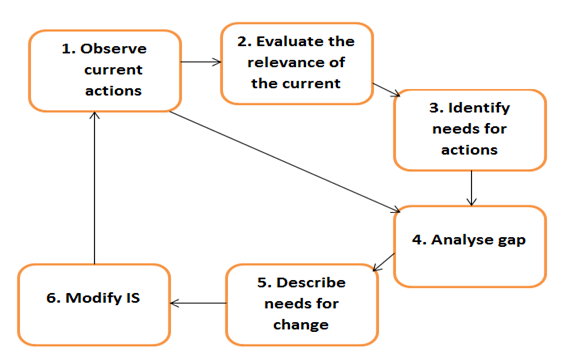 A continuous change process is required in order to maintain the relevance of the business (Truex et al. 1999). The change process must focus on the IT-systems, the information systems, and work activities in other parts of the business. An information systems action repertoire decides the types of information activities the information system can perform. If an information systems is clearly structured as an action repertoire different activities such as transactions, business interactions, and services can be composed from this repertoire. 1. IS flexibility for use is the range of possibilities provided by an information system until a major change is required. 2. Flexibility to change or the potential adaptability for further changes of a given information systems (Gebauer and Schober, 2006). Mostly, researchers focus the issue of flexibility to use on the functions of the information system that can be determined by designers. All features should not be rooted in the IT products in advance. IT resources allow uses that are not yet envisioned by the developers of the resource (Knoll and Jarvenpaa, 1994). Though inadequate flexibility of an information system to support a business process prevents the use of the system in certain cases, excessive flexibility of an information system can limit the usability of the system (Silver 1991), in addition to presenting an unnecessary investment. The type of flexibility that is built into an information system impacts system performance, in particular regarding the extent to which the system can be changed after its initial implementation. To summarize, Information System flexibility has been considered as vital indicator of information technology triumph. Presently, organizations need to act in progressively dynamic environments. It is imperative to improve information system flexibility with flexible information technology infrastructure also adjustable application systems has been a critical issue for IS managers (Prahalad and Krishnan, 2002). Information systems must be flexible to gratify user requirements, mainly in changing environments. Adequate Information System flexibility could lengthen the life cycle of information systems and expand the efficacy of IT investment.